If a major leaguer were to step to the plate in 2009 without wearing a helmet, it would appear as out of place as today’s “no-stirrup” pants would have looked in the mid-1950s. In addition to creating a buzz in the dugouts and among the fans, it would also catch the attention of the umpires, who simply would not allow a batter to face live major league pitching without a protective helmet. That’s simply the way the game is played today. As difficult as it may be to fathom for old-time fans who remember the game in earlier incarnations, it has now been a full 30 years since a major league player stepped into the batter’s box wearing only a cap and no helmet. The last such man was a journeyman backup catcher named Bob Montgomery, who took his final at-bat in 1979, marking the end of the game’s longstanding helmet-less era. Montgomery’s final big league appearance occurred eight years after Major League Baseball made helmets mandatory for all batters. The landmark new rule included a grandfather clause, allowing veteran players who had become accustomed to wearing caps at the plate to continue to do so. Those players did have to insert a protective plastic liner within the cap to give them some protection from errant fastballs and wayward curveballs. Bob Montgomery: Montgomery’s name, though hardly of the household variety, will be familiar to diehard Red Sox fans who can recall the pennant-contending years of an overweight George “Boomer” Scott, an older Carl Yastrzemski, and an underappreciated Dwight Evans. Those who really know their Red Sox history might even recall that Montgomery, at one time, appeared to be a more advanced prospect than a Hall of Fame catcher named Carlton “Pudge” Fisk. As he made his way through the Red Sox farm system in the mid-1960s, Montgomery drew favorable reviews for his defensive excellence, his sureshot throwing arm, and his budding power. But Montgomery’s progress stalled in the minor leagues; he did not arrive in Boston until 1970, when he was already 26 years old. Montgomery never became the star the Red Sox had once anticipated, mostly because he failed to hit the way that Fisk did. Outside of the 1973 season, when he slugged .563 in 128 at-bats, Montgomery never sustained much offensive success. Instead, he became the younger Fisk’s caddy, settling into a longtime role as the Sox’ No. 2 catcher. During the ’70s, Montgomery developed a reputation as one of the game’s best backup catchers, largely based on his broad defensive skills and good rapport with Red Sox pitchers. Unlike many players who bristle at a backup role, Montgomery embraced it. He loved playing in Boston so much that he often told reporters that he preferred being a backup catcher for the Red Sox to being a starting catcher somewhere else. For teammates who knew about one of Montgomery’s off-the-field hobbies, his decision to bat without a helmet probably created little surprise. After all, Monty owned a pilot’s license. He often piloted his private plane around Winter Haven, Fla., where the Red Sox spent spring training. For a man brave enough to fly his own plane, batting without a hard hat probably seemed inconsequential. After his playing days, Montgomery became a color announcer on Red Sox telecasts before entering private business. He is still asked about being the last man to play without a helmet; though surprised by the attention it brings, he takes some pride in being the last man to place his trust in the cap and the plastic liner. And that cap and liner carry on his legacy to this day, as part of the permanent collection of artifacts at the Baseball Hall of Fame. Tony Taylor: An extraordinarily popular player in his day, Taylor is fondly remembered by Phillies fans who followed the club throughout the 1960s and ’70s. Though never a star, Taylor gained favor as the Phillies’ second baseman during the Connie Mack Stadium years. Installed at the keystone in mid-1960, Taylor remained at the position until the middle of 1971. The five-foot, nine-inch fireplug drew praise for his hustling style and nifty fielding, along with his team-first approach. After a successful two-and-a-half-year stint as a platoon player and pinch-hitter for the Tigers, Taylor returned to the Phillies in 1974. When he took the first at-bat of his second tenure in Philadelphia, fans at Veterans Stadium showered him with a standing ovation. Given Taylor’s status as an aging journeyman, the reaction from the Philly fans was eye-opening. By the time that Taylor made his encore in Philadelphia, he lacked the range to play second base every day. Still, he managed to forge a new role as a pinch-hitter and utilityman, occasionally filling in at third base, first base, and second. When the Phillies left him off the postseason roster in 1976, many fans and several of his teammates complained about the omission. The 1976 season marked Taylor’s final year in the major leagues. At the age of 40, Taylor called it quits, leaving Montgomery as the last man to bat without a helmet. As popular as Taylor was during his playing days, he has become somewhat of a lightning rod for controversy as a coach and minor league manager. While managing the Utica Blue Sox of the New York-Penn League in the late 1980s, Taylor listened to an ongoing broadcast in the team dugout and then became enraged when the announcers second-guessed his decision-making. More recently, Taylor completed a stormy tenure as a coach with the Marlins under then-manager John Boles. After Boles was fired, some of Florida’s other coaches accused Taylor of backstabbing the ex-manager by serving as a “snitch” for the front office. Norm Cash: In looking at Cash’s 1972 Topps card, you’ll notice that it showcases two of his trademarks. 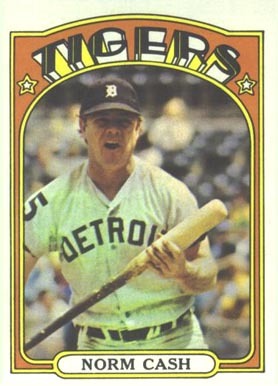 A longtime starting first baseman and dependable left-handed slugger for the Tigers (and a onetime teammate of Taylor), Cash is seen holding a bat that may or may not have been filled with cork. In addition, there is full evidence of him wearing a soft cap filled with a protective liner in a 1971 game. For those who knew Cash, such fearlessness came as no surprise; it probably bothered Cash little that a pitcher might come up and in against him. Cash made other intriguing bat-related news later in his career. With Nolan Ryan in the midst of throwing his second no-hitter during the 1973 season, the free-spirited Cash decided to walk to the plate without a bat, instead carrying what appeared to be a strangely shaped piece of wood. Legendary Tigers broadcaster Ernie Harwell described the item as a piano leg during his play-by-play of the game, but it was actually a table leg, taken from a piece of furniture in the Tigers’ clubhouse. The offbeat Cash had every intention of using the table leg, but was forced to discard the makeshift “bat” by Ron Luciano, the usually good-humored umpire who was not so amused by Cash’s stunt. Even with a regulation bat, Cash proceeded to strike out against the power-packed offerings of Ryan. After making news during the Ryan no-no, Cash came back for one more season in 1974. Even with his reactions slowing, Cash continued to bat with only a cap and protective liner until he retired at season’s end. He eventually became a color broadcaster and played briefly in a professional softball league. Ever the hard drinker and partier, Cash died all too young in 1986, when he became intoxicated, slipped and fell off a dock, and drowned in northern Lake Michigan. So what are we to make of these three baseball dinosaurs, “reverse” pioneers, if you will? Perhaps Montgomery, Taylor and Cash should be commended for showing a little bravery and a little old-school toughness at a time when the major leagues made it easy for all players to conform to the new standard. Or maybe they were just a bit foolhardy, unwilling to adapt to a change that was meant to enhance their safety on the field. I’m not sure which approach to take. But let me say this. As someone who saw what happened to David Wright in a recent game while wearing a helmet, I shudder to think what might have happened if he were wearing a soft cap with only a plastic liner. As much as I like nostalgia and the style of baseball that was played in the ’60s and ’70s, the mandatory adoption of the helmet is one change that should never be reversed. Good stuff. Monty is still doing color commentary on Pawtucket Red Sox (AAA) cablecasts. Fun article, thanks. I would bet if someone came up to bat today without a helmet on that a lot of pitchers would be afraid to pitch inside for fear of hurting them. The helmet makes it easier to pitch high and tight. Paul, good call on Taylor. He was a good middle infielder for the day, one that too many are willing to judge just by looking at his OPS numbers. Second basemen and shortstop were generally not expected to carry a large offensive load in the sixties. Taylor also had a nice second career as a pinch-hitter and utility infielder, first with the Tigers and then with the Phillies. He made a pretty smooth transition from everyday second baseman to backup spare part. Covers some of the deaths involved during baseball games. A good read. I think that the pine tar is a little high on Stormin’ Norman’s bat. To think that Billy Martin was his manager on the Tigers! Monty is the furthest thing from a “journeyman”. He played 10 season, ALL with the same team.